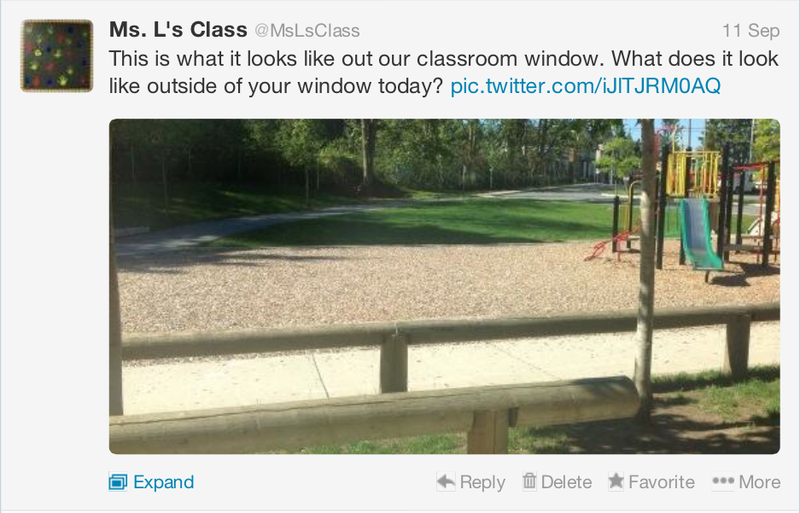 In the past I have written about how my students are using twitter in a primary classroom. As my students use Twitter for learning it also helps them develop their student learning communities. In previous posts I've talked about how my students have created hashtags and have invited others to join them with their learning and how they have also joined hashtags created by other students to learn with them too. Hashtags, and the shared learning that occurs within them is an excellent way for students to build learning communities. It is within shared hashtags such as #santasec13 (sharing secrets about Santa), #2d3dshapes (clues about 2d shapes and 3d solids), or #discoveryfn (sharing about a Discovery Education webinar about First Nations people) where my students better understood that there were other children in different parts of the world learning the same thing as them. To no surprise my students were equally as excited to read the posts that others were adding to the hashtag. Shared hashtags also helped my students learn how to solve math problems from other children. When they were tweeting math number problems to the hashtag #numberstory different classes responded to their questions in different ways. As much I was their teacher and I was showing them that there were different ways to solve math problems they finally understood the different ways when they saw the tweets from the other children solving their problems in different ways. Shared hashtags are an excellent way to help learners build student learning communities. Students can build learning communities by sending out random tweets too. This year during our first week of school we sent out one little tweet with a photo attached. "This is what it looks like out our classroom window. What does it look like outside of your window today?" That one tweet brought my students replies from around the world and each tweet taught my students a little more about the different places the tweets had come from. Behind every tweet was a class ready to learn and share with us. My students had many questions or comments for the people behind the tweets and they asked them. They were developing their own learning community from the tweets that interested them most. My students have also learned with other students by reading and answering questions that they have found on our class twitter time line. When a class was using twitter as tool to collect data we were able to help them with their learning. I could go on an on with examples of how using twitter has helped my students create their own learning communities with other children from around the world. If you're looking to help your students find their own learning communities Twitter is another great way to do this. If you've missed Part One and Part Two of this series on Building Student Learning Communities please follow these links. Part Four will be up shortly. Thank you Sarah. I can't wait to see what you get up to next year.